Sydney’s winter’s are short and sharp, it gets really cold for about six weeks and then its over. As a result we are, as a city, woefully under-prepared for cold weather. Visitors from colder climes cannot believe how freezing our under-heated houses are, with most people scraping through the winter months with a bare minimum of heating. I grew up in a cold climate on the Northern tablelands in a big, draughty, poorly heated house and I lived in the Mountains in a series of weatherboard cottages, built as a summer get-aways, which were impossible to heat, so I’m used to shivering through the winter months, but Sydney winters are in a class of their own. Nobody bothers investing in proper winter clothes. My thick winter coat is over twenty years old from when I lived in Melbourne. Every time I consider buying a new winter coat, it’s like yeah-nah. What is the point in buying something I’d only wear for a couple of weeks in a year. Decisions like putting another blanket on the bed or dragging the hot water bottles out from the hall cupboard are delayed, until winter is almost over, because spring always seems just around the corner. I’ve been having a decades long disagreement with my partner about the virtues of electric blankets. (They’re economical and it’s good not to shiver for half an hour in a cold bed before you fall asleep ). He’s always refused to have one because of a deeply held childhood belief they were dangerous. He grew up without electric blankets, his parents fled the communist Yugoslavia before he was born and perhaps electric blankets were a bridge too far into unnecessary western decadence. However, a few weeks ago we were at a friend’s place for dinner and she was talking about the joys of her electric blanket. She debunked his long-held belief they were dangerous and while not enthusiastic ( too much western decadence?) he finally allowed we could get an electric blanket. After years of lobbying, I haven’t rushed out to buy one because… it’s Sydney, the worst of the cold will soon be over and warmer days are on their way. Even if I can’t be inspired to buy an electric blanket, winter is a good time to indulge in some deep fried food. I don’t deep fry that much, but when it’s deep in the dark, cold heart of winter there’s nothing like some deep-fried morsels like pakoras to warm you up. A few weeks ago, I was visiting my brother and his kids in the country and I made some pakoras to go with spinach dal for dinner. I get a bit nervous cooking vegetarian food for kids. I worry about it being too weird and feel I need to load up on the cheese to make it kid-friendly. But my niece (11) and nephew (13) are awesomely appreciative and adventurous eaters. 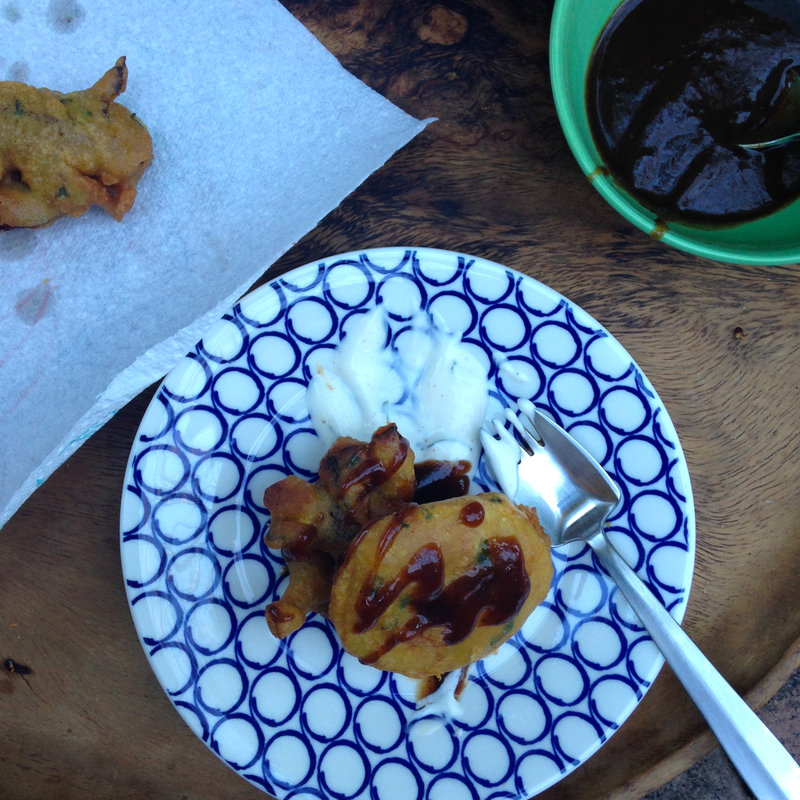 The dinner was a big success, but really who can resist pakoras – deep fried food is delicious! Because I was away from home and I couldn’t be bothered making my own tamarind chutney I bought an excellent Pattu tamarind and date chutney at the local Indian grocery shop. If you can’t be bothered making your own tamarind chutney and you can’t find a good commercial one barbecue sauce makes a pretty decent substitute. You can serve these pakoras as part of a meal and turn a simple dal and rice meal into a party but they are also great as an afternoon tea snack. Serve them with cucumber sandwiches and scones for a full Anglo-Indian last days of the Raj extravaganza. These pakoras can be made with almost any vegetable. Onion pakoras are my favorite but I usually do another vegetable for a bit of variety. Capsicums, pumpkin or lightly steamed cauliflower florets and slices of potato are all good. I spice the batter fairly simply but you can make it spicier and use different combinations of spices that you have to hand. I use a bit of self-raising flour, which makes the batter lighter, but if you want to make the batter gluten-free use all chickpea flour or replace the self-raising flour with rice flour. Vegetables of your choice – For this amount of a batter I would use one large red onion slice in half and into half-moon wedges and a quarter of a cauliflower cut into small florets (steamed) or one large potato sliced (steamed). Sift or whisk flours and spices. Add 3/4 cup of water and whisk together until smooth. If the batter is too thick add some extra water until it is a nice consistency to coat the veggies. Leave to rest for at least half hour. Heat oil for deep-frying. I use a small Indian wok and test the oil by dipping a piece of onion in it, if it sizzles nicely it’s good to go. Dunk your slices of vegetables one by one into the batter with tongs. Be careful not to overcrowd the cooking oil or the temperature will drop too much and the pakoras will be soggy. Deep fry until golden brown. Drain on kitchen paper and serve hot with tamarind chutney, barbecue sauce and a coriander or mint yogurt raita*. *I usually make a simple raita by beating finely chopped coriander and mint, cumin, chilli, salt through yogurt but this recipe here uses commercial mint sauce with yogurt to make it a, just like an Indian restaurant, sauce. I’m going to have to try it!